Your ceremony is the heart of your wedding day. As an experienced wedding officiant in the San Francisco Bay Area, I work with you to create a ceremony that fits you and your unique love. It can be as simple as "Do you...?" "I Do." 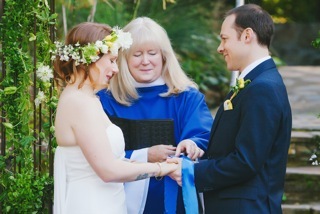 Or a ceremony that incorporates your personal vows and selected readings. I have married over 4000 couples and would be honored to work with you to on this important and life changing occasion. Non-religious, non-Christian, spiritual, traditional, non-traditional, civil, or customized ceremonies. Formal, casual and sometimes short notice. Affordable rates.